In 1890 Anshe Chesed and Tifereth Israel, the city's Reform congregations, had their cemeteries side-by-side on Willet Street on the city's west side. Tifereth Israel was the sole owner of Mayfield Cemetery. On October 8, 1890 at a special meeting attended by the members of both congregations it was voted to join their cemeteries, forming The United Jewish Cemetery Association, known today as United Jewish Cemeteries. It would own and operate all the burial grounds and also assume their mortgages. 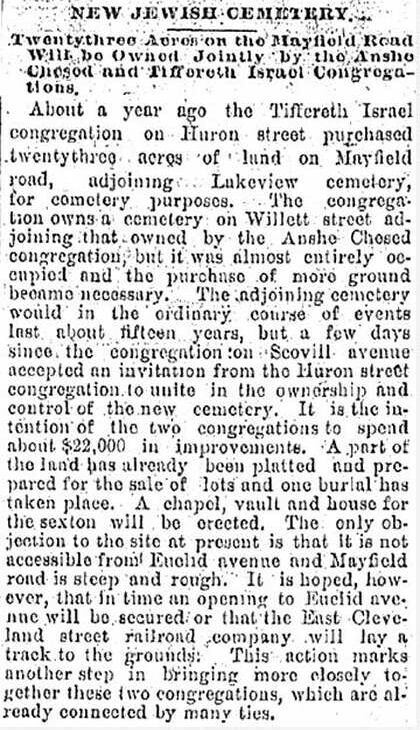 The Cleveland Plain Dealer of July 18, 1890 told of the new cemetery and the plans to improve it by erecting a chapel, vault and office for the sexton (caretaker), at a cost of $22,000. Corrections to the Plain Dealer account: it was three years (not "about a year") between Tifereth Israel's purchase of Mayfield Cemetery and the merging of the cemeteries of both synagogues; Also 23 acres was the total area of the three cemeteries combined. Ruth Dancyger's History of the Temple suggests that The Temple and Anshe Chesed worked together in buying Mayfield Cemetery. There may have been informal talks, perhaps at the Excelsior Club where leaders of both congregations socialized. A reading of the Tifereth Israel minutes for those years does not mention this. The minutes of Anshe Chesed for that period seem to be lost. The archives of Anshe Chesed at the WRHS contain a brochure mailed to its members in 1923. Its cover and page one appear below. The preamble to this schedule of costs for lots and services was written when UJC was formed. Visit the website of United Jewish Cemeteries.